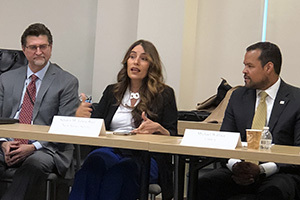 Senate Education Committee Chairwoman M. Teresa Ruiz engaged business and education leaders in a lively discussion at NJBIA on Thursday about the need to diversify apprenticeships and to create apprenticeship mentoring programs for women, minorities and the disabled. “We need to give apprenticeship opportunities to people who are not represented in the tech industry, in the health industries and other growing industries,” Senator Ruiz, D-29, told members of NJBIA’s Education & Workforce Development Policy Committee. Apprenticeships open up well-paying career paths, but too many people lack access to them, she said. 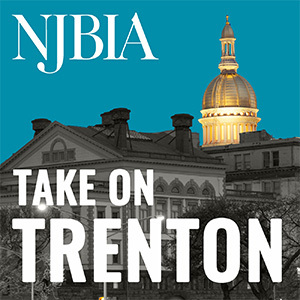 Senate Education Committee chairwoman M. Teresa Ruiz, D-29, speaks to business and education leaders at NJBIA on Feb. 21. The Senate is scheduled to consider a package of education and workforce development bills today, sponsored by Senator Ruiz and Senator Troy Singleton, which seek to remedy this by opening up more apprenticeship opportunities to women, minorities and disabled adults. The first bill, (S-3064), creates a task force to develop a statewide plan to diversify apprenticeships, and the second, (S-3068), would require the Department of Labor & Workforce Development to create an apprenticeship mentoring program for women, minorities and people with disabilities. A third bill (S-3381) addresses the issue of high school graduation testing requirements to ensure students have the necessary English, math and computer skills needed to succeed in post-secondary career training or college coursework. NJBIA President & CEO Michele Siekerka noted that NJBIA’s Post-Secondary Education Task Force found that the added expense of post-secondary remedial courses, also known as E-credit classes, compound the college affordability problem for New Jersey students. “We have students that take out loans and use that loan money on E-credit classes, and it puts them further behind the eight ball because those classes don’t count toward their degree,” Siekerka said. S-3381 amends current law to allow the state to develop a statewide assessment for reading, writing, and computational skills to ensure high school graduates are proficient and able to succeed in post-secondary opportunities, whether they be college or career, without the need for remediation coursework.